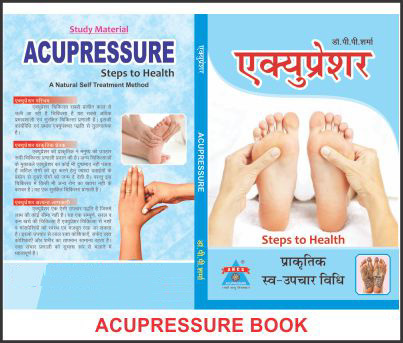 Acupressure Book- Hindi Acupressure is an ancient healing art that uses the fingers to press important points on the whole body. It works by stimulating the body's self-curative abilities. Acupressure mainly focuses on relieving pain and discomfort as well as on responding to tension. When the key points of the body are pressed, they promote the blood circulation and releases muscular tension. There is no side effect because no drugs are used. This book has been written by renowned author Dr. P.P. Sharma and Compilers Mr P.C. Choudhary in Hindi. Easy language used, any one can understand the treatment therapy, in this book all points are explained with diagram. Reflexology chart included, very useful books for library and every house. रोग और एक्यूप्रेशर द्वारा उपचार से संबंधित रोगो के बारे में जानकारी मिलती है तथा एक्यूप्रेशर के उपकरणों के बारे में भी इस बुक में विस्तृत रूप से बताया गया है !